As a young kid growing up in a farm town, Ross Mathews might as well have wished for a pet unicorn or a calorie-free cookie tree to grow in his front yard. Either of those far-fetched fantasies would have been more likely to come true than his real dream: working in television in Hollywood, California. Seriously, that stuff just doesn't happen to people like Ross. But guess what? It totally did. Now, with his first book, Ross takes us inside his journey as a super-fan, revealing the most embarrassing and hilarious moments of his small-town life and big-city adventures. From learning to swear like a hardened trucker to that time in high school when had to face down the most frightening opponent of all (his girlfriend's lady bits), Ross holds nothing back. Oh, then there's his surprisingly shady past involving the cutest pair of plus-sized women's pajama bottoms, deliciously dangerous pot butter, and embezzled sandwiches. And, of course, how he's managed to turn an obsession with pop-culture into one-on-one interactions with celebrities like Gwyneth Paltrow, Tiffani-Amber Theissen, Madonna, Michelle Kwan, and countless more without ever having a single restraining order issued against him. 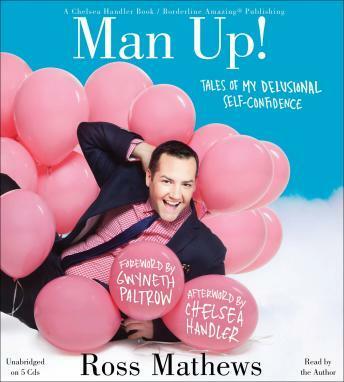 Infused with Ross's trademark humor, unique voice, and total honesty, Man Up! is a mission statement for anyone who doesn't fit the mold. His hasn't been the most traditional way to build a career in Hollywood, but Ross has somehow managed to make his mark without ever compromising who he is. He is as serious about this as he is about Golden Girls trivia: You don't need to change who you are to achieve your dreams (although there's nothing wrong with a makeover every now and then). You just need to Man Up! Great book and stories! Narrated wonderfully!